Acer launched its new Aspire One netbooks at an event yesterday and we were among the first in Europe to get a look at the Aspire One 521. The netbook is the first of what AMD hopes will be a long line of netbooks based on its silicon, enabling it to properly compete with Intel's Atom chips. 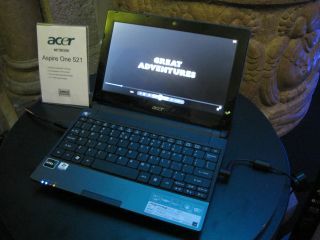 Sadly its biger brother, the Aspire One 721, wasn't at the event, so we weren't able to check that one out, too. These netbooks aren't based on the AMD Vision platform that we'll be hearing more about when it's launched later today. As you can see, the netbook has the usual high quality finish we've come to expect from the Aspire One series. The lid is glossy, with stand-out shiny silver writing and an imprint finish. The new netbooks come in two sizes, 10.1-inch and 11.6-inch (the latter is the Aspire One 721). Each has a slim and light low profile design and both have ATI Mobility Radeon HD 4225 graphics with analogue and HDMI display ports - here's the HDMI in use. The keyboard is very good to type on, continuing the tradition of good-to-use keyboards from Acer. There's also reasonable spacing between the keys. The touchpad is a little less user-friendly, but is pretty good compared to most netbooks on the market. While Acer's talk was of HD graphics, the screen resolution isn't up to the job. You can get 1366 x 768 (WXGA) panel resolution on the Aspire One 721, but not on the lower end model which is 1024 x 600. Even so, it's hardly the HD netbook that we've been promised by both Acer and AMD. Under the hood, the Aspire One 521 boasts a 1.2GHz AMD V105 single-core processor, 160GB hard drive and 1GB of memory. Without a more in-depth poke around, it was difficult to gague performance properly, especially since the netbook was running the nippy-on-anything Windows 7 Starter. The 11.6-inch Aspire One 721 boasts the 1.3GHz Athlon II Neo K325, so should have a bit more poke.